MUST WATCH: Guy Heartlessly Hit a Girl in Public! Some of us encounter different and unexpected scenarios in public places. There are a few who cover those scenes that is somewhat related to crime and violence for them to share it to various social media as part of everyone's awareness. An example of this is a video taken by an unknown citizen and posted the footage on Facebook. 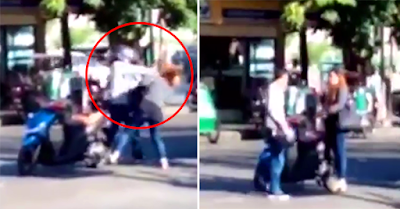 As seen in the video, a guy wearing motorcycle helmet ruthlessly punched (or slapped, not that sure due to video's very low resolution) the girl thrice in her face. It seemed that the guy was so angry that is why he intended to hurt the girl. Regardless of how are they related to each other, still a violence exhibits on it. In addition, it happened in a public place that most of the people in the area witnessed the scene. We cannot judge them on what we saw in the video, and it is much better to know what is the real reason behind what happened. But then, their problem they are facing that time is a private case that no one should inter middle. However, in my opinion, this should not be tolerated because they were in a public place and they cannot avoid other people to intervene. Still, the best thing to do is have a descent talk without any cruel physical acts.